Lilly is a sweet, but scared little girl. She didn’t leave her kennel the first few days but has since perked up and follows me around! She comes when you call her name and loves to be petted on her back (but not head/face). Lilly likes to eat but doesn’t drink much so I usually monitor her while she is around me to make sure she gets enough liquids. She still doesn’t understand going out side to do her business, however, has been trained quickly on the potty pads. She’s a fast learner! Doesn’t care too much for treats but enjoys a chew toy. Lilly also does well with her harness/leash and doesn’t resist too much. She adores my pug, Oscar, and learns how to do things from him. -Update from foster home. Lily is doing much better this week. She is really energetic and wants to play and chew on toys. She still hasn’t gotten the hang of going potty outside, but she does like to eat the snow. Lily follows me around and likes to sit next to me on the couch. She loves eating and has gotten a lot better about drinking. She is such a sweetie to my put, Oscar and lays next to him at night! -Update from foster home Lily is potty-trained! She has not had an accident in the house for over 2 weeks and is doing great about going outside. She is independent enough to go out and run around/do her business and wait patiently at the door when she is done! She loves to play with chew toys but doesn’t really like stuffed toys very much. She is quiet and doesn’t bark but does whine when she can’t find me. 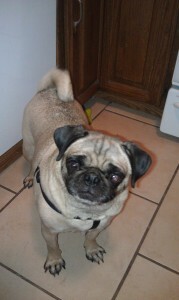 Lily is such a lovable pug and really just wants to follow someone around! She can go up and down stairs and is good on a leash. Lily also knows the command “sit”! I don’t know how she does around cats but does great with big and small dogs. Yes we kept her name. Lilly will ALWAYS be Lilly. I just added another L.
Lilly is doing spendidly! She had a small adjustment period in the beginning just getting her schedule down and making friends with my pug Kenny. They were FAST friends and really enjoy each other now. Lilly and Kenny get walked everyday and she loves it. I think she was long overdue for walks and exploring. She LOVES to stomp on leaves. She is a great dog who has come out of her shell and finally gets to experience a life a pug should have…Just being a friend and a family member in her forever home. I love pugs. I couldn’t imagine having another breed of dog and I know now I don’t know what we did without Lilly being a part of our family.